Recipe Updated with step by step procedure. My weekday lunch would be pretty simple and healthy. Especially when I'm packing for lunch box , both my Hus and kid has many restrictions, so I always prefer to make variety rice with poriyal and curd rice with pickle. Coconut Rice is one of the basic rice dish that is prepared often at my home. Those who love the fragrance and taste of coconut would definitely enjoy it. Its really very simple to make even who doesn't know cooking, provided they cook rice. The generous use of coconut in typical south Indian cooking is enormous. It adds excellent flavor to the various dish. Both fresh / dried coconut is used to prepare sweet, curry, chutney. Some of the Indian foods are considered to be tasteless without coconut. Dal Makhani is a signature delicacy from the state of Punjab and very famous in all over India. A healthy and creamy staple food as it is very rich in proteins,calcium and fiber. In this recipe,soaked dal and rajma are pressure cooked until soft and then tempered with spices and finally with fresh cream. You can avoid using cream and butter to make it low calorie version. Milagai Bajji is a ever favorite snack, especially snacking at the marina beach is ultimate delight. The magnificent scenes of the cold evening, when the sea waves touching the feet, admiring the sunset, children playing the kite, parents watching it with delight and kids building the sand castle. The quick aroma of the hot frying milagai bajji makes me rush to relish 😋. Life is so beautiful with all those nostalgic vision. Preparing the same beach style milagai bajji at home is quick and simple with all those basic ingredients available in the kitchen. Buy the big green bajji mirchi and use it. Choose the pale green mirchi for mild spice, bright green will be good for spicy tongue. There are many variation to prepare mirchi bajji with or without stuffing. This is a simple south indian version of street food. Wash the chilli/milagai thoroughly in the tap water. Pat dry with clean towel. Slit the milagai on one side and carefully remove the ribs and seeds. Apply few pinches of salt evenly to each of the milagai and keep it ready. Sift the besan in a wide mixing bowl. Add the rice flour, chilli powder, ajwain, cumin, turmeric, baking soda and salt. Add water little at a time to make smooth batter. I used approx more than 1/2 cup of water. Taste the batter for salt and spice, add if needed. Heat sufficient heat in a kadai / frying pan to deep fry the bajji. Take a tbsp of hot oil and add to the batter, mix well. Add few drops of batter to the hot oil to test check the tempature. If the batter puffs immediately, oil is ready to fry. Dip the milagai in the batter, carefully drop in to the hot oil. Allow to cook without disturbing for couple of minutes before turning the other side to cook. Fry the bajji both sides evenly until golden brown. Drain to the kitchen tissue. Serve hot bajji with coconut chutney. Removing seeds from the milagai and adding salt reduces spiciness and heat of the milagai. The seeds may sometimes cause indigestion and not good for stomach. Adding hot oil to the batter helps bajji from sucking excess oil while frying. Adding little amount of rice flour gives crispiness to the bajji. For variation try with vazhaikai/plantain, capsicum, onion. Sambar is definitely a best combination with all south Indian breakfasts. But pressure cooking dal /lentil and further cooking with vegetables and tamarind water takes a little longer time. Pottukadalai / Instant sambar is an easy and fast procedure to make exactly similar Tiffin Sambar. The sambar is so simple, it doesn't call for lentil and tamarind. The fried gram/pottukadalai gives the thickness and taste to the sambar. Make a paste of fried gram with coconut and sambar podi, add to cooking onion and tomato gravy. Add salt to bring out the delectable aroma. Garnish with coriander and serve. Blend the fried gram, coconut with sambar powder to coarse paste. Mix the paste with enough water to avoid any clumps. Keep aside. Heat a deep pan with oil. Add mustard, when it starts to splutter add cumin, asafoetida and red chilli. Add onions and fry till it becomes transparent. Add vegetables(optional) at this stage, sprinkle little salt to cook fast. Add the chopped tomatoes and saute well. Add the turmeric and ground paste. Add around 2 cups of water or more as needed to the sambar thickness. Allow it to cook for around 8-10 minutes over medium fire. 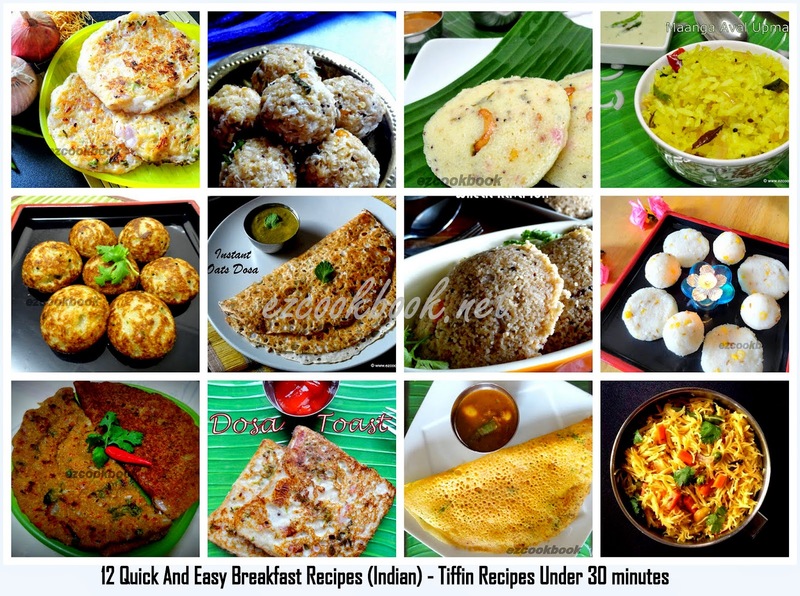 Serve with Idli / Dosa /Pongal / upma of your choice. If you don't have sambar powder use chilli powder(1 tsp) + corinader powder. I wanted to share with you all this post since long time, Today I made it. Homemade Rava Mix, is an instant and handy option for quick breakfast or dinner. All you have to do is prepare the rava mix once in a month and stock it up use it as needed when you are in a jiffy. This is a much better option to eat at home rather than going for takeaway back for Office. Also a good keep-up recipe for bachelors and can avoid fixing to ready to eat foods from stores. Below I have explained the procedure for how to utilise the rava mix for making delicious variety of recipes. And the foremost option is Rava Upma which everyone use to try when they start to cook as a newbie. When I started my cooking journey my very first experiment is rava upma and came out well. My intension here to give simple and useful DIY recipes which all can try at home easily and stay healthy. Heat oil in a heavy bottom wide pan. Add the mustard, wait to splutter followed by add cumin, channa dal and fry well. Add the green chillies and fry until turns slight brown. Add the cashew nuts and few torn curry leaves. Once the cashew becomes crispy golden , add the rava and saute well. Stir in the rava and mix well. Stir constantly over medium flame for about 10-12 minutes or until the rava becomes crispy and aromatic. Add the salt and mix well. Cool the mix completely before storing. The instant rava mix is ideal for making quick breakfast like upma, khichidi, idli, dosa, roti, paniyaram. Add 2 cups of water, allow to boil. When it starts bubbling add 1 cup Instant rava mix and stir vigorously with ladle or using hand whisk to avoid lumps formation. Cook, covered over low flame for 5-8 minutes until upma cooks completely. Serve hot upma with pickle or sugar or chutney. Heat a fry pan with a tbsp of oil. Add one chopped onion , a cup of chopped carrot, beans and green peas. Add a pinch of salt, turmeric and stir well. Allow it to cook with chopped tomato. Pour 3 cups of water and allow to boil. When it starts bubbling add 1 cup rava mix and stir vigorously with ladle or using hand whisk to avoid lumps formation. Cook, covered over low flame for 15 minutes until khichdi cooks completely. Finally add a tbsp of ghee and stir well. Garnish with chopped coriander. Serve hot khichdi with coriander chutney and sambhar. Mix 1 cup of rava with 2 cups of buttermilk. Heat dosa pan, grease some oil. Pour a laddle of batter and spread evenly thick like oothappam /pancake. Drizzle oil all over the surface, allow it to cook until golden and flip other side to cook for a minute. Mix 1 cup of rava with 1 cup of thick sour curd and mix thoroughly. Add little water if needed and the batter should be like idli batter consistency. Add a tsp of eno and mix well. Pour the batter to the greased idli moulds and steam cook for 12 minutes. Serve Rava Idli with chutney and sambhar. Heat a dosa pan, grease some oil and pour the rava batter along the edges of the pan and continue trickling it inwards to form a thin dosa. Fill the gaps any, if needed. Apply oil all over the edges and center. Cover and cook dosa for abt 3-4 minutes until top layer set and edges turns slightly golden. Lift the dosa off the pan and serve immediately with chutney. Using this instant rava mix , you can try lot more recipes and I will update other recipes soon in this space. Always use coarse rava for this homemade preparation. The homemade rava mix stays good for 2-3 months. Beyond that may start becomes stale. For a longer shelf life , ziplock and freeze it.